Despite the fact that we’re surrounded by water, many New Yorkers have never had much of a connection to the sea that surrounds Manhattan and Long Island like a string of clues left behind by the receding glacier that created our constant surroundings. Filmmaker and photographer Thomas Halaczinsky, who splits his time between Brooklyn and Greenport, has been fascinated by the archipelago spreading east from the island the Lenni Lenape Indians called Mannahatta, or “land of many hills,” since he arrived in the city in 1991, an immigrant from Germany who saw this place with fresh eyes. 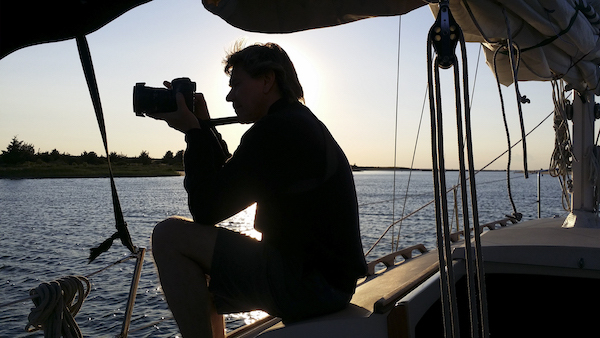 Mr. Halaczinsky has been documenting this world with his camera since 2012, sailing from island to island on a 30-foot O’Day sloop named Sojourn, culminating in the publication this year of “Archipelago New York,” a chronicle of his travels. When Mr. Halaczinsky arrived in New York in the early 1990s, he was shocked to find that most New Yorkers didn’t give a thought to the decaying waterfront at the periphery of their city lives. At the time, he was living in Tribeca, and he passed a nautical chart store there on his way to the subway each morning. On the wall in that shop was a chart drawn by Adriaen Block, the first Dutch explorer to document the string of islands heading east from New York City, after whom Block Island is named. During this time, New York was gradually awakened to the value of its waterfront, in part through books like William Kornblum’s “At Sea in the City” and Phillip Lopate’s “Waterfront,” and through the city’s efforts to revitalize its waterfronts as recreation areas for its citizens. Mr. Halaczinsky had learned to sail as a young man in Germany, but when he first came to New York, he couldn’t find anywhere to even get on board a boat. On a trip to City Island in the mid-1990s, he arrived just as the last boat rental shop was closing down. But he had friends with boats, and enlisted them in his explorations, before ultimately finding his cruising sloop, named Sojourn, in New Rochelle. With Adriaen Block’s explorations in mind, he set out on a “post-colonial exploration” of his own. 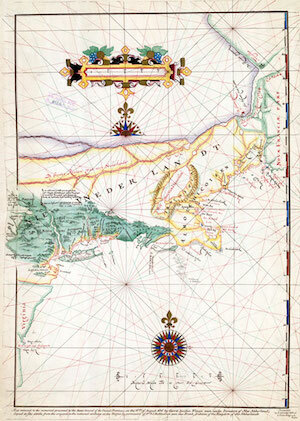 Adriaen Block actually described this string of New York islands as an archipelago. Mr. Halaczinsky estimates there are about 70 islands in this stream, but that number is constantly in flux, as barrier islands connect and disconnect from the mainland, as new islands are created with fill and old, low island succumb to erosion and rising tides. Many of the islands surrounding New York City were originally used to separate people. Before Ellis Island opened in 1890, recent immigrants would be quarantined on Hoffman Island or brought to an infirmary on Swinburne Island far in the outer reaches of New York Harbor. The mentally ill were housed in psychiatric wards on Welfare Island, now known as Roosevelt Island, while prisoners are and were incarcerated on Rikers Island in the East River, while the country’s largest potter’s field is on Hart Island in the Long Island Sound. “They’re dark and somewhat mysterious, and some of these islands have really fascinating stories,” he said. In his travels, Mr. Halaczinsky found Fishers Island, which is in Southold Town but only publicly accessible via a ferry from New London, Conn., one of the most beautiful places to visit, but he was equally enamored with Broad Channel Island in Jamaica Bay, a little island right off of the runways of JFK International Airport, where a fishing community of several thousand residents still live in houses built on stilts to withstand the constant tidal fluctuations. 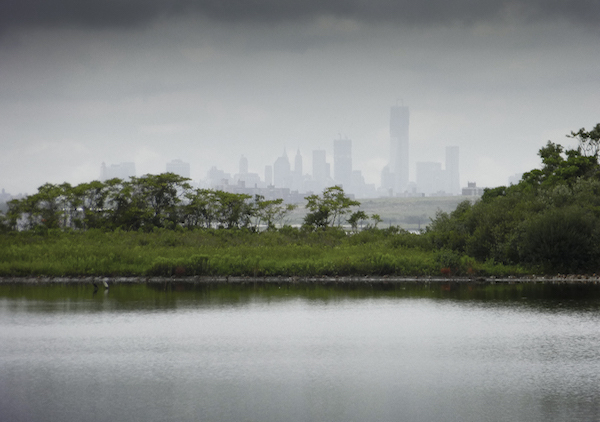 At home in the middle of the marsh, he said the islands were home to a dizzying array of bird species, with the skyline of Manhattan peeking through the fog in the distance. Mr. Halaczinsky said Broad Channel Island had no police force during Prohibition, and many houses there still have trap doors in the floors where rum runners would bring in illicit alcohol. 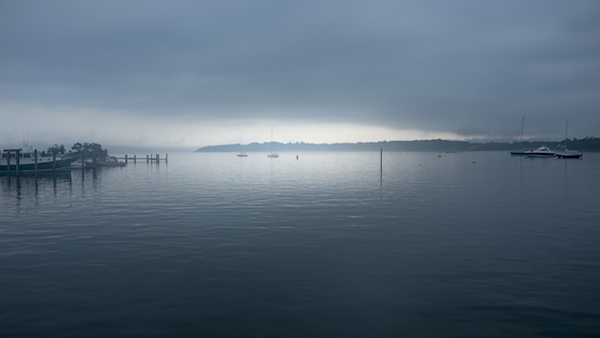 Thomas Halaczinsky’s photograph of Fishers Island in the fog. Mr. Halaczinsky said he’s still drawn to the mystery of Gardiner’s Island, which is in private hands and inaccessible to the public, and to Plum Island, long the home of a storied animal disease research center that could soon become open to the public. “Archipelago New York,” published May 28, 2018 by Schiffer Books, is available in bookstores now. 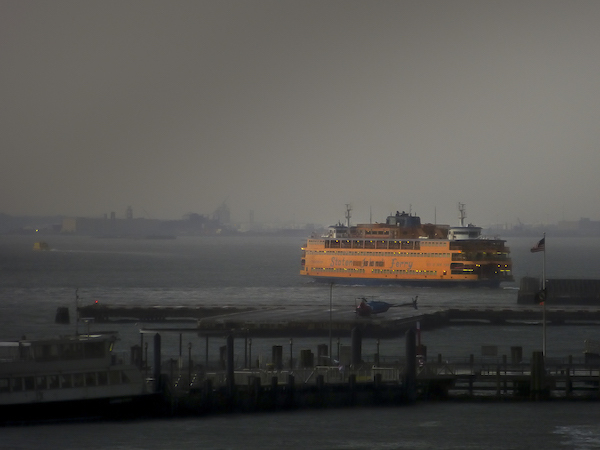 Mr. Halaczinsky’s photography in connection with the book is on display through July 9 in a group show at VSOP Projects, 311 Front Street in Greenport, and is also the subject of a solo exhibition through July 21 at the Brooklyn Waterfront Museum. Mr. Halaczinsky will also give talks about the book at the Oyster Bay Historical Society on July 19 at 7 p.m., at the Southold Free Library on July 28 at 11 a.m. and at the South Street Seaport Museum on Sept. 6 at 6:30 p.m.
More information is online at archipelago-newyork.com.